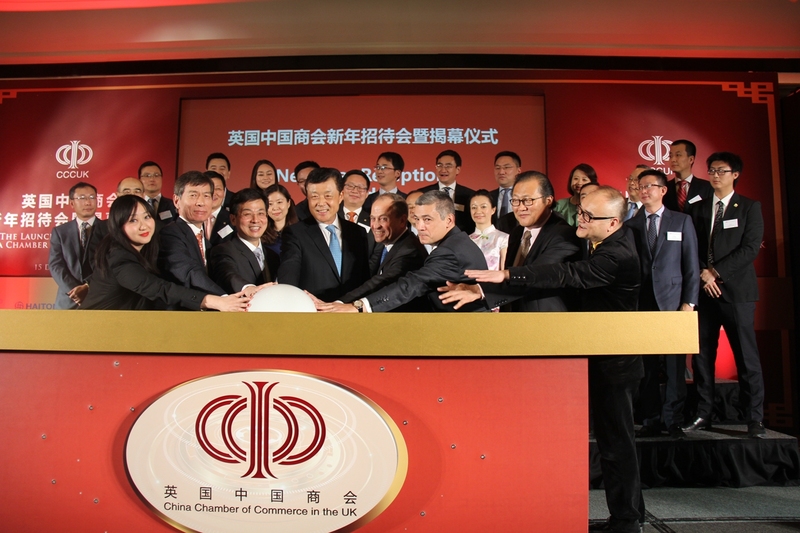 It is such a pleasure to join you for the very first New Year reception of the China Chamber of Commerce in the UK. I welcome this opportunity to meet with all the friends present tonight, both old and new. This is a good time to review the fruitful year of 2015 and to look into a promising new year of 2016. · You are now much better organised and even more professional and efficient. · You enjoy a rising reputation in the UK. · And you deserve this new level of success. Later this afternoon, we were together at a symposium that you co-hosted with the 48 Group Club. Now, we gather again for the CCCUK New Year reception. This is CCCUK's grand debut in Britain. This is your first and brilliant appearance in London with a brand new image. I want to say that today is your day. Please accept my warmest congratulations! · You are a crucial bridge linking China and the UK. · You are a vital bond tying our two countries together. · And you are like a big family gathered under CCCUK. Over the past year, the CCCUK led by Chairman Si Bingjun and his team has done tremendous work to provide its members with a strong backing, an effective platform and a bigger and unified voice. I highly appreciate the active role played by the CCCUK and its corporate members during President Xi Jinping's State Visit to the UK. · You were an important partner in the preparation for major events including the China-UK Business Summit. · You have coordinated very closely with the Chinese Embassy. · And you made significant contribution to the success of the State Visit. · President Xi paid a successful State Visit to the UK. · Together, we upgraded our relationship to a global comprehensive strategic partnership for the 21st century. · And we opened up a 'Golden Era' for China-UK co-operation. 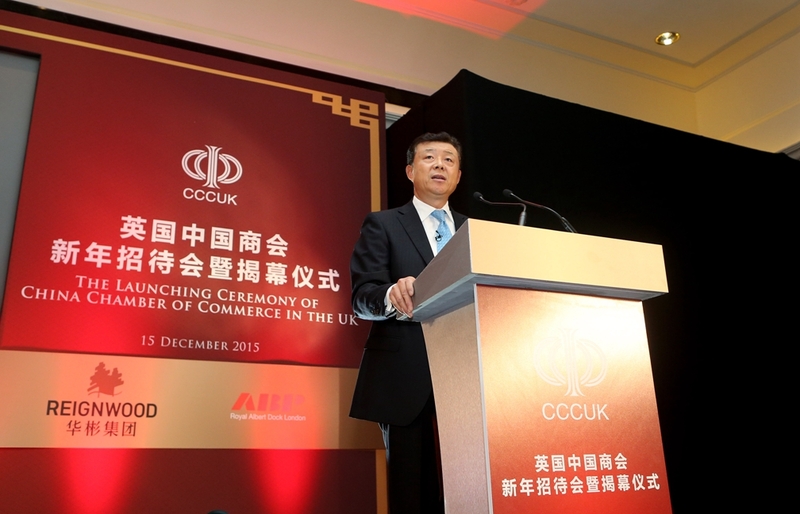 The year 2015 was a year of immensely productive business cooperation between China and the UK. Our two countries signed business deals with a value of 40 billion pounds. These business deals covered energy, transport, manufacturing, finance, tourism and many other key areas. · London is now the most vibrant RMB offshore market in Europe. · For the first time in London and outside China, the People's Bank of China issued RMB-denominated central bank bills. · Important steps have also been made in our green financial cooperation. · Starting from January 2016, the UK will issue to Chinese visitors two-year visas with multiple entries. · In the future, UK visa validity will likely be extended to an even longer period. · Now the two sides are working on reciprocal arrangements. · The deal clinched by China General Nuclear Power Group for the Hinkley Point C is the biggest single investment ever made by a Chinese company in the UK. It is also the first-ever investment by a Chinese company in a nuclear power plant of a developed country. · The Industrial and Commercial Bank of China completed the acquisition of a 60% stake in Standard Bank Plc. and opened the ICBC Standard Bank in London, signifying an important step of ICBC's international business. · The China Construction Bank listed its exchange traded fund on the London Stock Exchange. This is the first RMB-denominated Money Market ETF. · The Agricultural Bank of China listed dual currency bond equivalent to one billion U.S. dollars on the London Stock Exchange. This is the first green bond issued by a Chinese financial institution. · The Bank of China set up its London Trading Centre to deal with quotes and trades of offshore RMB, foreign exchange, industrial metals, commodities, bonds and other derivatives in Europe and Americas. · The China Development Bank issued dollar and Euro bonds in London and officially opened its London Representative Office. · PetroChina reached agreement with BP to step up their cooperation in shale gas and petroleum products sales. · The Alibaba Group upgraded its London office to a strategic center for its business in Europe. · The C.banner International Holdings bought the 255-year-old British toy retailer Hamleys. · The Geely Group invested 250 million pounds in a new factory in the UK. The new factory will be a combination of R&D facilities and production lines. It will be devoted to developing the next-generation, pure electric and ultra-low-emission London Black Cabs. · The BYD company is partnering with local business to develop and produce a version of a zero-emission electric bus and has received the largest order ever in Europe's electric bus market. · Huawei Technologies UK set up a joint workshop with the University of Manchester on graphene technology and launched an optical communication research institute in Bristol. · Last but not least, Chinese enterprises are making investment in London's housing market as a strategy to diversify their international assets. The above examples are only a few of many more success stories. The list can go on and on. If your business success were not mentioned here, it only means there are too many to name them all! All the business success stories are clear and concrete evidence, that for the Chinese enterprises in the UK, the time has come for action and harvest. This progress is only possible due to your great efforts of years of exploring the market and gathering experience. At present, China-UK cooperation is at a new historical starting point, a window of important opportunity when so much can be achieved. · China will build a moderately prosperous society by doubling the GDP and average personal income on 2010 basis. · China's GDP per capita will reach 12,000 U.S. dollars, closing in on high-income economies. The size of China's economy and market will strongly boost the confidence of Chinese companies going global. This will greatly support their development overseas. · Promoting high-tech and green industries. · And seeking to highlight London's role as an international financial centre. All these mean new cooperation opportunities for business communities of both our countries. "If you can innovate for one day, do so from day to day and forever keep building on the innovation." Today, we live in an ever-changing age and innovation is the ever-lasting theme. It is my firm belief that the CCCUK is committed to serving the Chinese enterprises in the UK and promoting closer China-UK cooperation. I hope that the institutional reform will give the CCCUK a good opportunity to inspire new thinking, build a new image and celebrate new achievements in the coming new year. 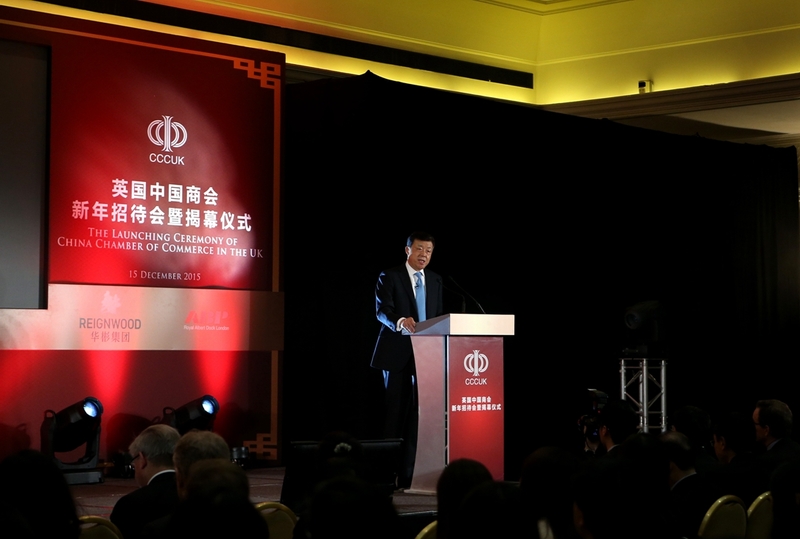 · That the CCCUK's undertaking in serving the Chinese companies in the UK and promoting China-UK cooperation will prosper. · And that the CCCUK will supply inexhaustible energy to help build a lasting, open and win-win China-UK partnership.